One would think listening to the online marketing gurus that you hear about new products, happenings online. This is not always true. I heard about Radio Zindagi from my wife who heard it from a colleague. Radio Zindagi is a - a AM radio station playing South Asian Music with predominantly Bollywood Hindi music on your dial at 950 AM in the Washington DC, Virginia, Maryland area. Originally based in San Francisco Radio Zindagi expanded into the DC area in June 2013. Even if the signal is sometimes spotty, I love listening on the weekend and getting a feel of nostalgia. 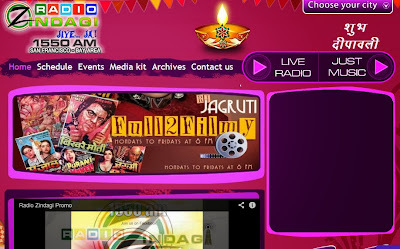 You can even listen to them online, streaming at Radiozindagi.com or Radio Zindagi Andorid App on Google Play. They are also on Tunein Radio. I love the causal banter from the DJs and the humor in the programs. If you are a fan of Bollywood music do check this station out, Of course on weekdays I am listening to Nathan Hager on WNEW or NPR's Marketplace. My weekends I try to catch the Prairie Home Companion, Car Talk and Wait Wait Don't Tell Me on NPR. Radio Zindagi is available 24x7 on 100.7FM and 104.7 FM in Central New Jersey with highest India population and also on HD2 97.1 FM in New York and Connecticut, and 950 AM in DC, Maryland and Virginia. Listen to AM 950 AM and let me know what you think?